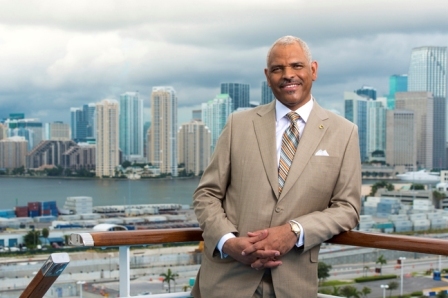 In 2013, Arnold Donald came out of retirement to accept a position as Carnival Corporation’s president and CEO after being recommended by then chairman and CEO, Micky Arison. Now, Donald is celebrating five years as the CEO of the world’s largest leisure travel company, making him one of only four African American CEO’s currently leading America’s largest public companies. Initially Donald accepted the title of CEO with slight hesitation. However, during his time there he has made record setting growth by successfully doubling the corporation’s earnings. Not to mention, Carnival’s stock price has nearly doubled in value which has allowed its market cap to increase from $27 billion to $48 billion. His career accomplishments don’t stop there. Donald has also played a major role in the way Carnival Corporation has done business by bridging the gap between nine global cruise brands to work together. This resulted in the company generating new sources of revenue, increased cost savings, and enabled sharing of best practices globally. Prior to accepting the position as Carnival’s CEO, Donald worked at Monsanto Company, as a leading global developer of agricultural products and consumer goods. He held various leadership positions there from 1980 to 2000. From there, Donald worked at Merisant Company where he served as chairman and CEO. After completing his time there in 2005, Donald worked as the president and CEO of Juvenile Diabetes Research Foundation International until 2008, when he joined the Executive Leadership Council. During his career progression, he found time to join the Carnival board of directors in 2001. Joining the board combined with his previous job experience and Bachelor of Arts degree in economics, Bachelor of Science degree in mechanical engineering, and his master’s degree in finance and international business, equipped him to hold his current position today. Aside from his education, Donald’s family background also played a major role in the way in which he conducts business and his outlook on the world. Donald, the youngest of five children, was born and raised in the ninth ward of New Orleans during a time of segregation. Donald goes on to say, he felt liberated and believed he could be a part of change. “Because of my high school, my parents, and my church, I believed that I could do whatever I wanted to do despite what society was telling me,” he said. Donald took that belief that was instilled in him and went on to completely transform Carnival Corporation. Among his many list of achievements, he is most proud of the diversity of thinking model and the first of a kind innovations that have taken place under his leadership. The diversity of thinking model, proactively engineered by Donald, has been seen as a “competitive advantage driving innovation by leveraging different backgrounds to create new solutions that help the brands [under Carnival] continually exceed guest expectations and support the company’s aggressive growth goals.” This model has been instilled at every level of Carnival Corporation allowing people from different backgrounds, cultures, and geographical areas to collaborate and be creative. As a result, innovation has flourished throughout the company. In 2017, Donald, became the first ever travel industry executive to serve as the keynote speaker at CES where he unveiled the Ocean Medallion, the world’s first interactive guest experience platform. The Ocean Medallion’s primary goals were to enhance the overall cruise experience for both the guests and crew and establish a new standard for the entire travel industry. Additionally, Donald is behind the creation of Ocean Originals TV programs, a series of travel lifestyle shows that air on ABC, NBC, Univision, and Telemundo with five million viewers each week. During the interview, Donald took time to talk to the LA Sentinel about his life lessons and advice he has for young people of color who are interested in pursuing a career in business. He goes on to say that the second lesson he learned is to do the right thing, have fun along the way and honor people. He encourages those who are thinking about a career in business to engage their time in things that they are passionate about. Under Donald’s tenue, Carnival Corporation has made history in Cuba by “opening Cuba for the U.S. cruise industry and positively impacting the broader international travel policies.” Donald has also pushed for global growth efforts in China and expanded cruising and long-term market opportunities in China. Additionally, he has accelerated fleet enhancement efforts to launch newer and more efficient ships across the brand. So what’s next for Carnival Corporation? Donald has plans to continue increasing shareholder value and exceeding guest’s expectations.